Al Tifrosh Min Hatzibur – What Does Separating/Connecting to the Community Mean in a CyberWorld? Our world is changing… will our synagogues keep up? My rabbinic colleagues sometimes argue about what online social networking really means. They differentiate between “real community” and “virtual world,” claiming that the former creates actual connections while the latter is, well, unreal. 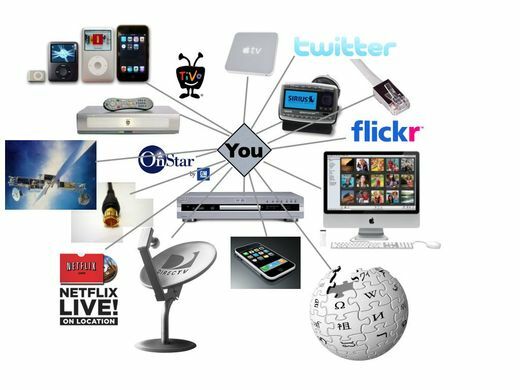 I keep wondering if differentiations they make are meaningless, because people increasingly live lives online, so that if we fail to embrace this new reality, we – synagogues, rabbis, non-networking communities – will soon become “virtual/unreal” ourselves. My 2-year-old daughter surprised me recently with two words: “Daddy’s book.” She was holding my Kindle electronic reader. Here is a child only beginning to talk, revealing that the seeds of the next generation gap have already been planted. She has identified the Kindle as a substitute for words printed on physical pages. I own the device and am still not completely sold on the idea. My daughter’s worldview and life will be shaped in very deliberate ways by technologies like the Kindle and the new magical high-tech gadgets coming out this year — Google’s Nexus One phone and Apple’s impending tablet among them. She’ll know nothing other than a world with digital books, Skype video chats with faraway relatives, and toddler-friendly video games on the iPhone. She’ll see the world a lot differently from her parents. that children who play these games would see less of a distinction between their online friends and real friends; virtually socializing might be just as fulfilling as a Friday night party. And they would be more likely to participate actively in their own entertainment, clicking at the keyboard instead of leaning back on the couch. We synagogues, and religious communities, will want to open ourselves to how the cyberworld reframes the rabbinic dictim al tifrosh min hatzibur – do not separate yourself from the community. If I am not within the synagogue, or even a member of a synagogue, but I read Jewish books, participate in online study sessions, watch/pray with streaming video services, socially-network with other like-minded Jews, email prayers about people who are sick and email prayer to be put in the Jerusalem’s Kotel (Western Wall) … am I one who is tifrosh – separated from the community – or not? Because my kids, and increasingly more of my congregants, and clearly so many of our 15, 20, and 30 year olds, feel so connected. There is a wide world of Jewish blogging out there. Jewish bloggers are commenting on everything from spirituality and ritual, to Israel and the Middle East, to politics and prayer. They are often the first ones with up to the minute commentary on Jewish issues of the day; clearly the best source for what is happening in Israel during a conflict. This week’s Heveil Havalim Carnival is up at Ima on (and off) the Bima. Just Table, Green Table: Rabbi Yoffie calls for a commitment to ethical eating, asking synagogue leaders to “carefully, thoughtfully, Jewishly” formulate new eating guidelines for their communities. Embracing Technology: Reform Judaism’s opportunity to engage with communities and help congregations relate to members in the online space has reached a tipping point. At the Biennial in Toronto, Rabbi Yoffie urged the Reform Movement to create congregational blogs and experiment with a range of creative technological approaches to strengthen community ties and help build community. Each of these initiatives offer food for thought (pun intended). I am particularly taken with his interest in expanding the use of technology within the synagogue world. We are finding, at Congregation Or Ami, that – through eNewsletters, this blog, our Facebook page, Twitter (newly using it), photo page and videos – we are reaching more people than would ever walk through the doors (except, perhaps, on the High Holy Days). My colleagues often ask me how I have time to do all of this social media and technology. I answer, simply, that our congregants are communicating this way, so shouldn’t we be utilizing their modes of communication to spread Torah, communal caring and deep Jewish spirituality? That’s what motivates me. How about you? If Or Ami is so involved in blogging, eNewsletters, twitter, and Facebook, why am I sitting with our president Susan Gould and Board Member Kim Gubner (and 75 other rabbis and Jewish community leaders) in a Board of Rabbis and STAR sponsored seminar on Communicating and building relationships in an age of New Media? We are here to hear and learn and figure out how to deepen the conversation within our community. It is fascinating how many synagogues are experimenting with various social media and new media. I am fascinated by how so many are struggling to figure out how to get it started. Workshops on working with the Main Stream Media mix with presentations on Social Media (facebook, del.i.cious, LinkedIn, Twitter). Conversations on how one-sided presentations (main stream media) is taking the back seat to the back-and-forth sharing and engaging of social media. A debate broke out as to whether what online communities are “real” communities or “virtual” communities. I tend to believe that these communities are real. I do as much (more?) counseling that happens by email and facebook, as I do face to face. More people connect with our messages shared by eNewsletter, blog, facebook, than through a Shabbat evening sermon (and I would argue, a higher percentage of listeners/readers than most rabbis – even those in the bigger synagogues – do on a typical Shabbat eve/day at services). People connect, share, build relationships, inspire, motivate… and we synagogues do too. Enough. I’m multitasking during this fabulous presentation. I must get back to the seminar (and to multitask on another task as well). I’ll miss posting, but I need to untether myself from the technology for a while. Read more about my Sabbatical. Read what I learned on the first phase of my Sabbatical in January, 2008. Get a sense of my diary of a rabbi blogger (and thus, why untethering myself will be really challenging). Bye! I’ll miss you all! Traffic to the blog has been way up this week, due mostly to the plethora of Passover resources up on the blog. I would be interested in hearing from readers about which Passover posts were most interesting and which, if any, of the resources you used (or plan to use) in your seder. Toss me a comment. Blogging has become somewhat of a lifestyle for me. Part hobby, part holiness, part habit. Readership is going up, as is the level of recognition from the blogging community. The Union for Reform Judaism’s Reform Judaism magazine recently included Or Am I?, this blog, in its “Best of the Blogs“, listing 3 top Jewish blogs. And Google’s A Jewish Blog Sampler included Or Am I? in its sampling of blogs. Rabbi blogging began as we prepared to leave on Or Ami’s first Family Trip to Israel. Struggling to bridge the divide between California Jews and our Jewish state, I decided to try out a new technology, the “blog” (a contraction of the term “Web log”). I figured it would allow stateside friends and congregants to track our Israel experiences. Little did I realize just how small this vast world would become. Armed only with the knowledge my 20-something intern passed on in an hour, I played with the medium, reflecting upon current events and the weekly parasha. The experiment soon morphed into Or Am I?, a blog exploring the intersection of the soul, Jewish spirituality and daily living. Blogging our Israel trip provided daily opportunities to find universal meaning in being a Jew in the Holy Land. I spent downtime on the bus reflecting upon each day. Sometimes I would pass the computer to invite participants to jot down their impressions. I would post these impressions and pictures each evening, and each morning I was astounded by how many friends and congregants virtually traveled alongside us. The power of blogs to connect people to experiences and ideas a world away was energizing. I began posting stories and Torah teaching on the blog. I had a modest readership. Then when Brandon Kaplan, a young man who could not read, write or speak became a bar mitzvah, the celebration had to be shared. His masterful signing of Torah, his machine’s vocalization of his d’var Torah speech, and his joyous hugging of Torah bespoke his deep love of Judaism. Guest bloggers gave voice to the nachas (joy) we all schepped (shared). Blogging provided an outlet to publicize our communal simcha and its meta-message: this special-needs child was just like every other kid. People who could not attend the service shared in the celebration. I learned that cross-posting articles in both our eNewsletter and the blog could further expand the circle of celebration. Although I spent the early part of the year kicking my BlackBerry addiction, I soon found blogging to be addictively spiritual. Whether teaching Torah, kvelling about community news or connecting Jewish values and current events, blogging provided an electronic bimah (stage) for reflection and inspiration. I realized that blogs were sermons for Internet surfers, offering a wider congregation for Torah teaching. When our Reform movement started its own blog (RJ.org) I linked up to a whole community of rabbi bloggers. While I was blogging our experience on faculty at the Reform Movement’s Jewish Summer Camp Newman in Santa Rosa, someone joked that although The Ten Commandments arrived on two tablets of stone, previously our sacred teachings were transmitted wirelessly. They said that originally God spoke, and anyone with rudimentary Wi-Fi adapters (called “ears”) could hear God’s message. If Torah encompassed our mytho-history, stories, values, laws and teachings, perhaps Torah then was God’s original blog, the Holy One’s reflections on birthing and raising the children of Israel. I got this silly idea to blog each night of the Festival of Lights. We explored Chanukah’s historical basis, social justice imperative, spirituality through mystical contemplation, its lessons about religious freedom, and its modern engaging music. A “you comment and I’ll give tzedakah” contest raised $152 for tzedakah and engaged many people in rudimentary blog conversation. A blog tracking program showed that more than 50 percent of my congregation read the blog and eNewsletter posts. But the pressure of finding something significant to share each night took its toll as blogging took over my vacation. On New Years I resolved to pre-blog next Chanukah, writing some posts ahead of time to relieve the pressure. As Israel and Hamas moved closer to direction confrontation, I discovered a whole community of bloggers dedicated to exploring Israel, Torah and Judaism online. CNN’s 24/7 news failed to rise to the plethora of perspectives from all across the political and religious spectrum. Whereas Israeli newspapers offered a certain amount of news, the blogsphere exploded with perspectives from soldier’s mothers, on the ground reports every five minutes, Twitter press conferences and perspectives from all across the political spectrum. I soon found myself reading the blogs before the papers, and then creating links on my blogs to informative posts from my new blogfriends. Although we laugh at Al Gore’s “invention of the Internet,” we Jews joke that we were responsible. More seriously, Jews have been using the latest technology for generations to transmit our sacred Torah teachings from one generation to another. Some created Jewish newspapers and eZines. Others, like Debbie Friedman and Doug Cotler, used modern music — tapes, CDs and iTunes downloads — to rejuvenate our prayers. Now we have electronic synagogue bulletins, DVDs, Web sites, podcasts, synagogue Facebook pages and rabbi blogs. What does it all mean? Old wine in new bottles. Community brought closer. Blogging is just Moses on a virtual mountaintop, offering a newer version of Torah’s storytelling and value teaching. Twitter: What’s It All About? 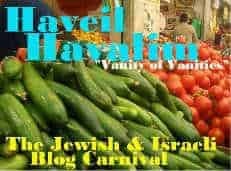 Haveil Havalim #203: Did You Love Leah? Welcome to the Loving (or Not Loving) Leah Edition of Haveil Havalim…. What’s going on here today? Pop over to Ima on (and off) the Bima for the original post. (I’m copying the first paragraphs here for those of you who are still new to reading blogs.) But then jump over to Ima on (and off) the Bima to read what else is being written about in the blogsphere. What was really important in the J-blogosphere this week? Loving…or not Loving….Leah, of course! Yes, Sunday night’s Hallmark movie was definitely a topic in the Jewish blogosphere this week. Mottel is Loving Lubavitchers in Hollywood. is now up over at Ima on and off the Bima. Check it out! 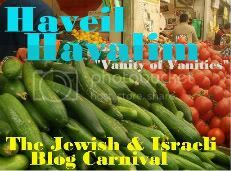 A very nice edition of Haveil Havalim, the Jewish Blog Carnival, is now up over at Ima on and off the Bima. Check it out! Since the Gaza Operation began, here’s what I do every morning. Review my Rabbi Listserves for updates from Israel. Then onto NYtimes, Wall Street Journal, CNN and Fox (gotta love how on every issue they see the world through different eyes). Then back around again and again. Until my wife or kids pull me away. Some say I’m a news junkie. Others believe it is just that I am an Oheiv Yisrael, a lover of Israel. Of course, I’m loving blogging. Blogging daily was one of my top 4 things to do on my vacation. 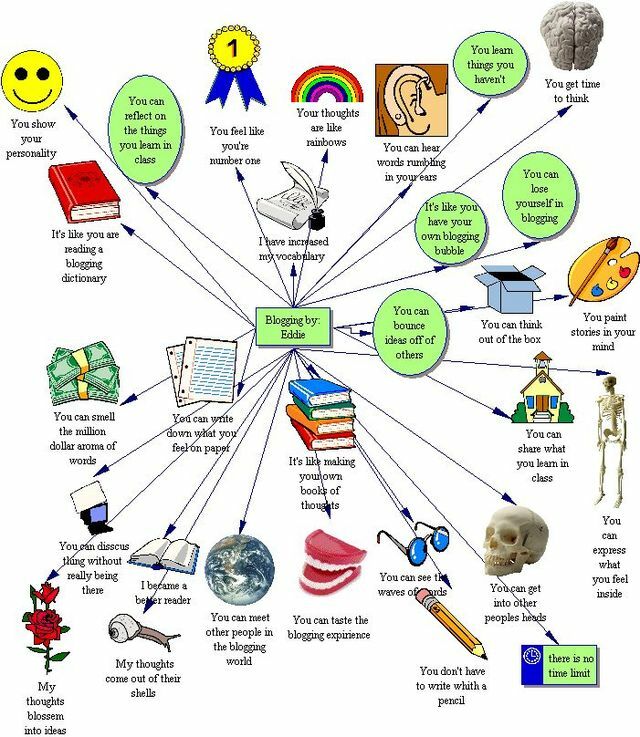 Here’s why blogging is fun, from Eddie’s Rainbow of Thoughts.